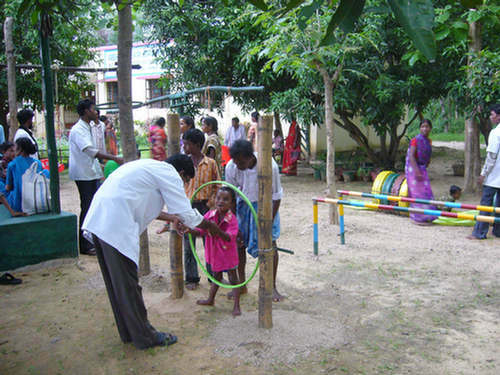 It is estimated that in the rural area being served by our clinic approx. 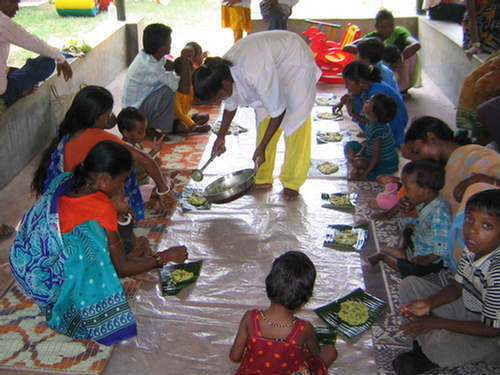 80-90% of all the villagers suffer from chronic malnutrition. This weakens their body and immune system, making them more vulnerable to infectious diseases and slowing down the healing process. Most of the children’s physical and mental development is impaired due to their nutritional deficiencies. Many of them suffer from cerebral palsy: due to lacking development of the brain since before, during or after birth, they have spastic paralysis or other kinds of disturbed body movement and coordination. In addition to this they may also have vision, hearing and speech difficulties and various degrees of mental retardation. Approximately 3-4 out of 100 children in our area have this condition since birth or early childhood. This is a very high incidence compared with the average of 2-4 children out of 1,000 in developed countries. According to conventional Western medicine, cerebral palsy is incurable. However, acupuncture treatment can greatly improve the children’s condition if it is done regularly from an early age. The treatment becomes even more effective when complemented by physiotherapy. The staff at Abha Seva Sadan have been successfully treating children with cerebral palsy in this way since 2007. Many of the children can neither stand nor walk when they come to the clinic for the first time; some cannot even sit and are also mentally retarded. After several months of treatment some can already start to walk slowly without any help, often for the first time in their life. In November 2010 an intensified treatment and rehabilitation program was started, using specialized techniques for the motor and sensory development of cerebral palsy patients, such as the Vojta method, which stimulates the damaged nervous system of the patient through special pressure points. In this program, on one day of the week only children with cerebral palsy are treated at the clinic. They first receive their acupuncture and physiotherapy treatment. Following this the Vojta method and other specialized techniques are applied. 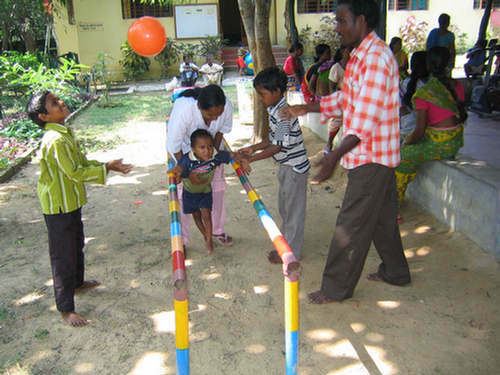 Then playful activities are done with the children to further stimulate and encourage their motor and sensory functions. 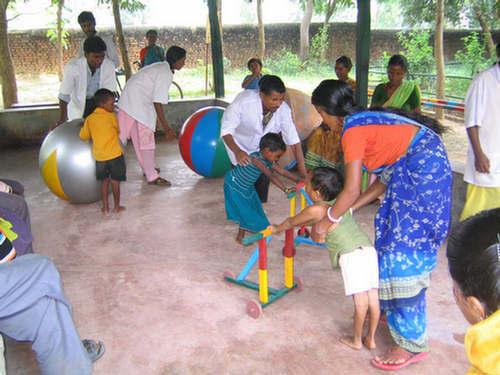 This involves physiotherapeutic balls of various sizes, walking aids and other equipment, including a small customized playground suited for the various conditions of the children. At noontime a nutritious lunch is served to the children. Through this weekly intensive treatment and rehabilitation program many of the children’s physical, mental and emotional conditions are improving radically. However, due to the clinic’s limited resources we are still far from meeting the needs of the many other children in the surrounding villages who suffer from cerebral palsy and other developmental disorders. In the future, with sufficient funding for additional rooms and staff, we hope to start a full scale Children’s Rehabilitation Centre, which will provide treatment for many more children as well as on a daily basis rather than only once a week. 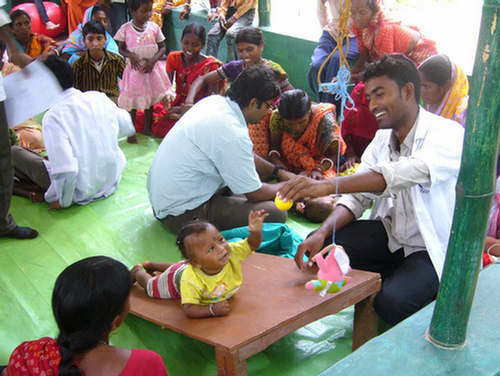 With the availability of a 4-wheel drive and a driver, many children could also be brought to the clinic and back home, who can otherwise not come due to their village being too far away and not being able to afford other means of transport. A short film following one of our young patients during a visit to our Children's Rehabilitation Centre. ...and every week they are reviewed by the staff. Other specialized exercises to overcome movement disorders. ...walking bars, balloons and more. The simple and customized playground. At the end of the program a nutritious lunch is served.